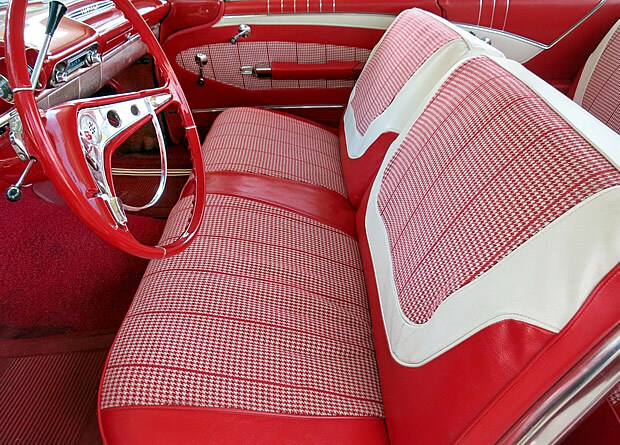 Check out this absolutely beautiful Roman Red 1960 Chevrolet Impala with red and white patterned cloth and leather-grained vinyl interior. It has a 348 cubic inch Turbo-Thrust V8 engine Turboglide automatic transmission providing 250 horsepower. For 1960 we saw a brand new, oval-shaped grille that enclosed the dual headlamps. Chevrolet was describing their new cars as, "Nearest to perfection a low-priced car ever came!" Check out our other article to see how it compares to the 1959 Chevrolet Impala. Impala was introduced in 1958 as part of the Bel Air series, for 1959 became its own series and was now top-of-the-line for Chevrolet. Check out those distinctive side moldings, bright rear end panel and triple rear lights. You can see the short chrome molding that extends back from the headlights that has two horizontal bar moldings above and below it - this was unique to the Impala. Also distinct to the Impala was the triple taillight configuration that was originally used in 1958 and reintroduced this year. Other noticeable trim on the Impala was the rear quarter missile ornaments also had two rearward pointing moldings that were filled with a contrasting color insert, that contained an Impala script and crossed racing flags insignia. The orginal sales brochure told us, 'Fisher Body richness and good taste are the mark of Impala interiors. All seats in all Impala models have luxurious foam cushioning'. 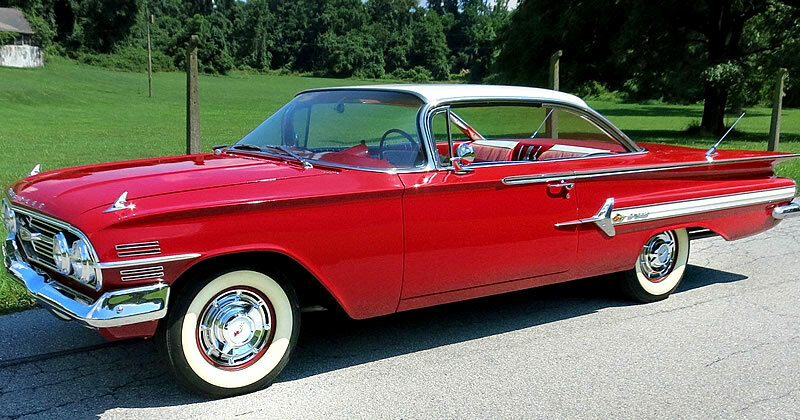 Chevrolet sold 204,467 Impala Sport Coupes for 1960 with the base price at $2,597 with a 6 cylinder engine. The 348 CID Turbo-Thrust engine and Turboglide transmission on this car would have cost an additional $398 when it was originally ordered. Had excat car same colors and engine and transmission the second time the transmission went out I gave it away. Should have put a power glide in it. Just how bad was the Turboglide? Apparently used car dealers were known to switch the indicator quadrant to one from a Powerglide car because the Turboglide had such a bad reputation. J.C. Whitney offered a complete swap kit as well. Those weren’t crossed racing flags on the Impala’s flanks. Those were Corvette crossed flags. Impalas had them because they were considered a more sporty and higher-performance car. And the reason this car has the Corvette crossed flags on the grille and trunk lid is because it has the 348 engine. The 283-equipped cars would have a simple Chevrolet emblem above a “V” for V8. On the 6-cylinder-equipped cars, there would be a simple Chevrolet emblem without the “V”.